This is Roger Payne talking to you from aboard the Odyssey in the tropical pacific. The wind is now in its third day of 'gentle,' and what a sweet difference that makes. We loll along like some old pensioner, with our pet fish at our side. Day merges into day, and I'm not sure whether the thing I am trying to remember having done was something I did yesterday or today. (As Dylan Thomas said: I'm not sure whether it snowed for seven days when I was eight, or for eight days when I was seven.") This sense of timelessness that long ocean passages eventually give one has been much written about and is about the loveliest part of the experience of crossing an ocean. Such a gift from the sea to lose track of time, and for a pause, a breath, a comma, to live a timeless life. I just realized that all day yesterday I had no thought of time-no idea of when I got up, when meals were or should have been, or when I went to bed. Once home, I'm sure I'll return to keeping up with everything, every wrestler's hold and referee's call in the scramble for the presidency, say, but today, out here, I am more interested in those rainbow runners. They were the first thing I checked when I got up this morning, and the last thing I tended to before going to sleep. And sure enough they are still here, still swimming next to us, and have been so all day, and now, with the sun about to go down, they are still there, ready, I suppose to swim with us all night, their fourth night with Odyssey, having swum 400 miles up until now and still without the smallest sign of tiring. Of course, some fish, like tuna, must swim forward constantly in order to keep enough water moving over their gills to obtain enough oxygen. Perhaps these fish are the same-their body form is similar to some members of the tuna family, and they are certainly active (they've proven that in spades). One knows all this but somehow never puts it together with the idea that if a fish ever chose to do its swimming alongside your boat, as these fish have, that it would swim tirelessly along just as these are doing. Thus there may be nothing whatever unusual about their non-stop swimming, only the fact that they are accompanying a boat while doing so. But what are they up to? Why do they stay with us? My theory is that they find the Odyssey useful for two things: we provide cover when large predators appear, and we are a fixed point of reference-a place around which they can collect, and when they fan out and come back they will always find other rainbow runners here. We're like those floating bits of flotsam under which dolphin fish and tuna and other species congregate. Only we happen to be moving. But so what. We still serve both purposes: good cover and a meeting point. And besides, we move into fresh areas, fresh prospects of that seemingly inexhaustible supply of tiny flying fish which scatter before us like seeds, and which the rainbow runners pursue, and presumably, catch-else what is powering their 400 mile swim. Mike, who has been watching from the mast, says that today they started to fan out ahead of the Odyssey, and to the sides as well. Both he and Marcia have frequently seen them making attacks on baby flying fish. So I suppose that with our fish at our sides, we and our rainbow runner battalion are now cutting a grand swath through the flying fish as well as through the sea. One theory that has been advanced to explain why tuna associate with porpoises (the association the tuna fishermen turn into the tunas' undoing by setting nets around the porpoises in order to catch the tuna beneath) is that the tuna presumably benefit from the ability of the porpoises to find fish through echolocation (a system the tuna lack). But this association only begins when the tuna are adults. When they're young, they hang out under floating logs in the eastern tropical Pacific. But as the logs drift further and further off shore and become more and more waterlogged they finally sink, whereupon the tuna must switch to congregating under something else. That far from shore there are no logs so they must use something that is moving: schools of dolphins, say. This becomes an association that seems to help the tuna far more than the dolphins. But the dolphins can't do anything to prevent it. The problem is that tuna swim so fast, once they decide to join a school of dolphins, the dolphins are stuck with them. There's no way they can get rid of them. It is believed that some tuna species congregate beneath floating objects at night, then spread out over huge areas during the day to hunt, returning to the same floating object at day's end. Certainly it's one way to keep track of a good hunting territory once you've found it. The most tons of tuna ever caught in a single set of a net came from a net that was set under a floating orange crate. Perhaps the tuna school had found good fishing in the area. But what is the advantage to a tuna to hunt with other tuna? Perhaps it takes many tuna to keep schools of prey from escaping. Certainly we see evidence of that with our rainbow runners when several take off together after flying fish. So maybe the Odyssey is a good meeting point, a good bit of cover from predators, and best of all, one that moves along, so that our companion fish are continuously brought into new areas to catch the flying fish that seem so ubiquitous and to be such a major part of their diet. The main trouble with this hypothesis is that if boats are so useful to rainbow runners and other species, why isn't every boat that crosses the western tropical Pacific accompanied by a school of Rainbow Runners. Or maybe it is, and I just haven't heard about it. Or maybe we are seeing the start of such behavior, and someday there'll be schools of rainbow runners around every cruising boat the way one sees flocks of gulls around fishing boats. Although we have not yet spent much time talking about it we have made occasional catches of dolphin fish during this voyage so as to collect their livers. 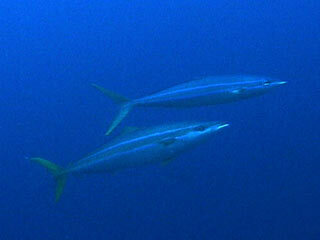 We do so because they are a pelagic species with a worldwide distribution-one that lives high on the food chain. By later measuring the level of contaminants in them we will have a check on the data we're obtaining from sperm whales. Rainbow runners are a good species to sample for the same reasons: they are large, active predators which, as we have seen, cover large areas of ocean, and have a widespread distribution. As our rainbow runners continue their tireless swimming beside us and their numbers grow, a new ethic is developing on board Odyssey-a division in sentiment amongst we motley few: those who would like to remove one or two rainbow runners each day for samples and fresh food, versus those who prefer to continue considering the waters around the Odyssey a Rainbow Runner Sanctuary. In fact a meeting on this very subject has just been called and I must go to it. There's a strange thing about the timing of this meeting; I just checked the numbers of our fish and saw... none. It was too dark to see well, but I have seen them each night even by moonlight. Have they left? Or will they be there again in the morning? Time will tell. More tomorrow. This is Roger Payne headed for a meeting about fish.